When Hewlett-Packard launched the BladeSystem blade enclosures nearly seven years ago alongside its "blade everything" strategy, no one but Google was doing custom, high-density machines and it looked like blade servers would be the corporate platform of choice. And so HP built the c7000 chassis, and its smaller "Shorty" c3000 sibling that followed it to market, for the long haul. But the advent of faster server and storage networking is putting a strain on the backplanes in the existing BladeSystem enclosures, and so HP's engineers went back to the drawing board and rejiggered that passive backplane to offer more bandwidth, thus positioning the c3000 and c7000 Platinum editions for another couple of years at the very least. 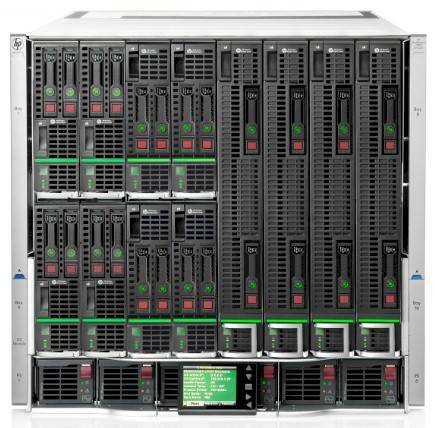 The new c3000 and c7000 blade enclosures, which are debuting at the HP Global Partner Conference in Las Vegas this week, can accept all of the blade, switching, and storage devices that their predecessors were designed to envelope. The new enclosures are also getting a new integrated switch that is really design to be paired with the new chassis, and HP is rolling out fast SmartMemory options on another blade as well as a new WS460c Gen8 workstation server blade designed specifically for virtualized workstations used in conjunction with VMware View or Citrix Systems XenDesktop. From the outside, you would be hard-pressed to tell the new c-Class enclosures from their predecessors, and to help you out, HP has painted a platinum stripe on the enclosure ears at the front of the unit that screw the blade house into a server rack. The c7000s, new or old, support eight full-height blades or sixteen half-height blades in a 10U rack enclosure. There are also storage, GPU coprocessor, and workstation blades for the chassis in addition to compute blades. The backplane in the chassis is a passive component and is basically a bunch of wires, so boosting its bandwidth is not as trivial as designing a new ASIC and cranking the clock speed as you can do with a switch, explains John Gromala, director of product marketing for the Industry Standard Servers and Software division inside of HP's Enterprise Servers, Storage, and Networking group. Gromala says you have to have electrical engineers do very clever things with wires and signaling to allow the chassis to accept more and faster signally. The new backplane is also sufficiently fat to drive lots of 16Gb/sec Fibre Channel adapters, which reach out of the server nodes to Fibre Channel switches that link to storage area networks. The new c7000 Platinum chassis also has a number of other features, including its own location discovery and thermal discovery services, which complements the similar services that were embedded in the ProLiant Gen8 servers and their control freakery a year ago. So now you can have the chassis as well as the blades. Both c7000 enclosures have eight interconnect blades in the back for networking, and the new c7000 Platinum has a shiny new one called the SX1018HP Ethernet switch, which is actually made by Mellanox Technologies for HP. This baby, which is based on the Mellanox SwitchX ASIC, has 16 downlinks running at 40GE speeds that feed through the backplane to mezzanine controllers on the server nodes and eighteen QSFP+ uplink ports. Not only does the SX1018HP switch have lots of bandwidth, but at 230 nanoseconds for a port-to-port hop running at 40GE, it has five times the effective bandwidth and one quarter the latency of prior 10GE switches. (If you run it at 10GE speeds, the latency is 250 nanoseconds.) The SX1018HP switch will ship for the new c7000 chassis in March, and you can put up to two inside the chassis for redundancy. Pricing information was not available for the SX1018HP. It can be used in conjunction with the ProLiant Gen8 BL420c, BL460c, BL465c, and BL660c blades. The new c7000 Platinum enclosure will be available later in February and has a list price of $4,999. Presumably this is a higher list price than the current plain vanilla c7000 chassis. It is not clear when the c3000 Platinum chassis, which is a 6U enclosure than can be mounted in a rack or tipped on its side and rolled into offices, will ship. But there will be a c3000 Platinum edition and it will support up to eight half-height or four full-height blades, just like the vanilla c3000.